I’ve added a Delete button in the Maps and Miniatures screens so you can more easily delete maps and minis you’ve imported. This is great if you made a spelling mistake when you brought it in, or if the grid wasn’t lined up correctly on a map. Posted on December 9, 2016 by 3DVTT and tagged 3D Virtual Tabletop. When someone gets knocked unconscious, you can make the miniature flat, to indicate to everyone what just happened. Another miniature can be moved into their space, and you can still see both miniatures, and easily manipulate them. Conditions, such as On Fire or Poisoned, or anything else, can be marked with half-sized tokens, using any symbol you want to upload. Props that lend themselves to being flat, such as pile of coins or something else on the floor, can be represented with flat tokens. Larger flat tokens are great for area effects. If you put a larger token, such as for a fireball, on an area with smaller tokens, such as for individual creatures, the smaller ones appear on top so you can still see and edit them. Flat tokens can be rotated as usual, and maintain their orientation in top-down view, which can be handy for things like space battles. I’ve found these useful in my own game, and I hope you do too. /clear – it will remove all the currently displayed chat messages to give a better view of the map. Posted on November 19, 2016 by 3DVTT. Over the last week, I’ve made it easier to import your own maps into 3DVTT. You can now drag the grid around to line it up, and there are buttons for fine tuning if needed. The guidelines for the grid can be either black or white, to suit any map, whether a forested wilderness or deep space. It also includes 2 views of the map, so you can see opposite edges of the map at the same time, to ensure the grid lines up everywhere. This is especially useful for those tricky maps that aren’t well formatted, making them a breeze to add. The video demonstrates all of these new things, both with a basic map, and a more complicated one. You can try it out now at 3dvtt.com/game. Posted on August 18, 2016 by 3DVTT. Using 3D terrain in 3D Virtual Tabletop is now much easier. You can do things in less clicks and Modify button is gone, since you don’t need it any more. Check out the video to see the refined experience. The latest online version also allows Kickstarter backers to claim their subscription rewards by entering a promo code. Instructions on how to do that are in the latest Kickstarter update. If you supported the campaign with a late pledge, email me at support@3dvirtualtabletop.com and I’ll tell you how to claim yours. Try it out now at 3DVTT Online. Posted on August 10, 2016 by 3DVTT. This new online version is not compatible with the existing mobile versions. My short term plan for this is to make the web version work really well in mobile browsers. So far it runs really well on iPad, with some more work for me to do to make it feel just as good on iPhone and Android. Subscriptions have also been simplified, no longer do you need everyone in your group to pay. You can try it out for free, and when you want to take things further, only one person in the group needs to pay $4.99 / month, rather than everyone having to chip in $0.99 / month. This changes things slightly for some Kickstarter backers. My current plan to handle this is to increase the rewards at some levels, such as by extending the term of the reward subscription, to ensure people feel like they are getting more than backing at a lower level. The addition of the marketplace also means I have an avenue to deliver many of the other rewards from the Kickstarter. Those will be included as I fill out the shop. Rewards for iOS and Android will be transferable to this new web version. Claiming your rewards is something I’m still working on and will be introduced in the coming weeks. In the mean time, you can try it out for free to get familiar with it, and run a game or two. Posted on August 4, 2016 by 3DVTT. 3D Virtual Tabletop is slimming down and shaping up for the New Year. I’m making some changes so that it can be available on all major platforms in a jiffy. My quest to make everything available to everyone has encountered some issues that are problematic or time consuming to get working on all operating systems and devices. As a consequence, I’m splintering off all of the functionality that I can get running well cross-platform, into a new parallel version of 3D Virtual Tabletop. Check out the screenshot for some of the exciting new features that will also be added. Once the alternative version is available to everyone to play games with, I’ll then resume work on updating it to do the things that didn’t make the cut the first time around. The splinter version won’t be compatible with the current one, but the versions on iOS and Android will remain available so you can keep using them. Later on, you’ll be able to move to the new one as it gets filled in with the things you are using. It is still 3D Virtual Tabletop, so anything you are entitled to in the current version, you will also be entitled to in the splinter version. The alternative version will be available on the Desktop first, before going to mobile. At this stage it looks like it will be beginning with Windows. Posted on January 14, 2016 by 3DVTT. When you tap on a miniature, there is now a new button. It allows you to delete all the miniatures on the map at once. It’s a convenience feature that should make your game sessions go just a little bit smoother. The update for the iOS App Store has been waiting for review for a couple of days already, so it should only be a few more days away. The Google Play update has just finished uploading so that should be available in a few hours. I’ve also been working on subscriptions so that when the Kindle Fire and web versions come out, everything will transfer across seamlessly. Posted on September 1, 2015 by 3DVTT and filed under 3D Virtual Tabletop, Google Play, iOS, Android. Scenarios & Miniature Naming Released! Apple have approved the Scenario and Miniature naming update, so I have released both it and its Android counterpart on Google Play. It can take several hours to become available in your local app store. A reminder: The multiplayer games in this latest version are not compatible with earlier versions, so you won’t be able to connect to or from older versions of 3D Virtual Tabletop. Make sure everyone you’re playing with has updated to the latest version, anything V2.1.42 or later. Posted on July 27, 2015 by 3DVTT and filed under 3D Virtual Tabletop, iOS, Android, Google Play. We’re at Gen Con this year and would be happy to see you at booth #3039 in the Exhibitor’s Hall. There’ll be lots going on, including some games from AAWGames / AdventureAWeek.com and Mike Myler being run on 3D Virtual Tabletop. You can tell us about how you’ve been using 3DVTT in your own games and what you’d like to see in the future. We’re constantly amazed at the creativity of you all. Posted on July 27, 2015 by 3DVTT and filed under 3D Virtual Tabletop. A new version of 3D Virtual Tabletop that includes scenario saving and miniature naming has been submitted to the iOS App Store and is awaiting review. When it is approved I can release the same update on Google Play. It also contains numerous other little tweaks here and there to make the experience smoother. One of which is a new feature to lock miniatures to the tabletop, so that they will be the only ones that stay around when a scenario is loaded or the map is changed. This is great for having a party of player characters visiting different areas with different maps, or prepared encounters saved as scenarios. The group will stay together as the environment around them changes, with other enemy miniatures in the previous scene automatically removed. Most of my time since the last update has been focused on finding a workaround for what was apparently a bug in Unity for 64-bit iOS devices, so I haven’t been able to make much progress on the web version. Now that I have been able to get the iOS version to work, the web version will be getting some love again. I’ll also be paying some attention to the Android variant for the Amazon Appstore too, hoping to get that out in the near future as well. Here’s a screenshot of the new miniature naming and locking in Castle Ravenstein. Posted on July 22, 2015 by 3DVTT and tagged 3D Virtual Tabletop iPad iphone android google play amazon apps. I mentioned last time that the iOS update was undergoing final testing before release. During that process I discovered a problem that occurred when testing on an iPad Mini 3, but worked fine on an iPad 2, and also works OK on my Android Nexus tablet. I’m still trying to work out how to fix it. There is a possibility that it has something to do with Unity’s new system for 64-bit iOS apps (the iPad Mini 3 is 64-bit, as are all recent devices, the older iPad 2 is 32-bit), I’m going to cover all possibilities. I’ll let you know when I’ve made some progress on that. I want to get this new version out as soon as possible because it really is the best one yet, with lots of little improvements everywhere. In the mean time, I’ve been working on the web version of 3D Virtual Tabletop, and I’m going to catch it up with the mobile versions. Posted on July 9, 2015 by 3DVTT and tagged 3D Virtual Tabletop ios iphone iPad. I’ve now got Miniature Naming fully working in 3D Virtual Tabletop. Before releasing the new version I’m running through to the app to make sure everything works as it should, tweaking things here and there, to smooth over any rough edges. That should all be done in a day or two. Using miniature names is new for the multiplayer connection, so I need to release the Android and iOS updates at the same time, so that they can talk to each other properly. This means it’ll be another week or so before Miniature Naming is available. I’ll let you know when I’ve submitted it to Apple so you can count down the days. The Scenarios iOS update has been approved by Apple. I’m reluctant to release it though, as in the mean time I have discovered certain situations around fog of war and multiplayer games where it doesn’t quite work as it should. Those issues have been fixed in the new Miniature Naming version and since I’ll be uploading it soon, I’ll use that one as the next public release for iOS. You’ll get Scenarios and Miniature Naming at the same time. Posted on June 29, 2015 by 3DVTT and tagged 3D Virtual Tabletop android iPad iphone ios miniatures. Here’s a screenshot of the new Miniature Naming that I’m working on for 3D Virtual Tabletop. It’ll be great for keeping track of different monsters and make it easier for players to say which enemy they are attacking. I could have really used this in a past encounter where I ambushed the party with 28 orc-like creatures. It would have made it much easier to identify each adversary. The names are saved with scenarios so you can set them up beforehand. I like to do this to give monsters descriptive names like “Bugbear with Torn Left Ear” rather than just a number. Everyone in the game can see the name, so you can’t use it for private info, but if you’re making notes, you can use it as an identifier. Names can also be changed on the fly to reflect conditions, which is especially helpful if you end a session halfway through a combat. Posted on June 22, 2015 by 3DVTT and tagged 3D Virtual Tabletop rpg. Good news for iPad and iPhone users. The update for 3D Virtual Tabletop that has loading and saving of scenarios, is now waiting for approval by Apple for the App Store. In the past it has taken them somewhere between 7 and 10 days to let it through. Posted on June 16, 2015 by 3DVTT and tagged 3D Virtual Tabletop iPad iphone. Great news! I’ve just finished uploading the latest update for 3D Virtual Tabletop to Google Play. The big new thing is loading and saving of scenarios. There’s a new button on the right for it. 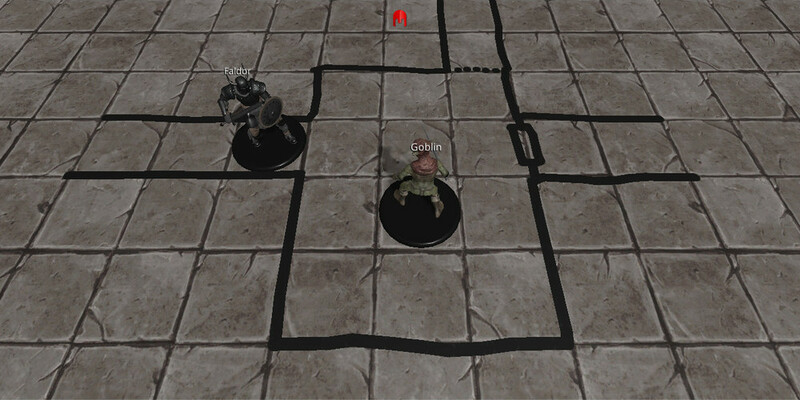 Saving a scenario stores the map with fog of war, and the locations of all the minis, along with the “Show Grid” and “Snap to Grid” settings that you’re using on the tabletop. This makes it really easy to pick up where you left off last session. At the moment, the scenarios are just stored locally on the device. A future update will sync them with your account so that you can access them anywhere. As with all updates, it may be a few hours before it appears on Google Play for you. I still have a little work to do to get Scenarios working on iOS. Hopefully it’ll only be another day or so, but I’ll let you all know when that’s out too. Posted on June 11, 2015 by 3DVTT and tagged 3D Virtual Tabletop android. Published by 3D Virtual Tabletop. Copyright 2012 - 2016 Tap on Fire Ltd.